I have been involved with the Chinese language and Traditional Chinese Medicine for the past 17 years, an adventure that started with my move to the southern metropolis of Guangzhou in 2001. After gaining fluency in Chinese I completed a 5-year post-graduate degree at the Hunan University of Traditional Chinese Medicine (HUTCM). As a student I worked freelance as a medical translator and interpreter and translated TCM books and articles which have been published in China and England. During my clinical internship at the integrated biomedical-Chinese medicine hospital affiliated with HUTCM I worked in both inpatient and outpatient departments. I was responsible for new patient intake and acupuncture treatments for the 10-bed ICU in the Neurological Surgery department, with a estimated total of 900 treatments over 2 years. During that time I also assisted the department chief with treatments in the outpatient Acupuncture and Tuina departments. 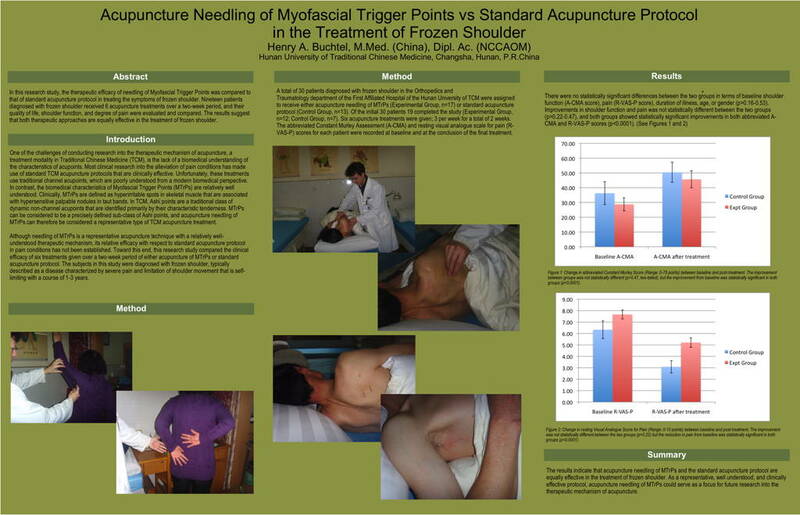 My Masters degree research, completed in 2011 and presented at the 2013 Society for Acupuncture Research conference, focused on the clinical efficacy of trigger point acupuncture in the treatment of frozen shoulder. I have been fortunate to have the opportunity to study with several renowned teachers and practitioners in China, and am currently co-authoring a book for Eastland Press (USA) about my teacher Prof. Peng Jian's clinical experience in herbal medicine.